Mankato, Minn. – Northflow Solutions, Inc. (Northflow) recently announced the new brand name, independent ownership and operation of the company. Taking a cue from our annual Business Person of the Year award, we thought we’d look around southern Minnesota to see what other businesses are being recognized in their communities for exemplary success and community involvement. 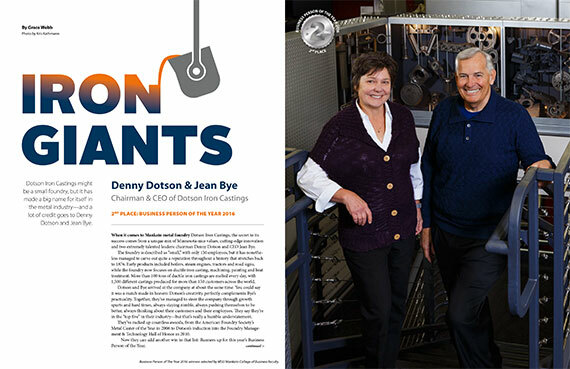 When it comes to Mankato metal foundry Dotson Iron Castings, the secret to its success comes from a unique mix of Minnesota-nice values, cutting-edge innovation and two extremely talented leaders: chairman Denny Dotson and CEO Jean Bye.